the fash pack: celebrate the rain? today we went to rockwell's urban bazaar. 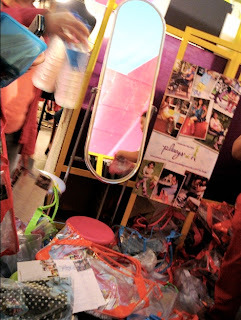 it was a packed rockwell tent, but we didn't see the usual stalls like irene's closet, pilar, crû, mimi, team manila... we were told that the organizers wanted new stuff that are not available in power plant. otherwise, people will just shop in the mall. there were lots of new "tenants," but the busiest stall was one that was kinda dark and messy, as in the merchandise was all over the floor. but people were crowding and we just had to take a peek. 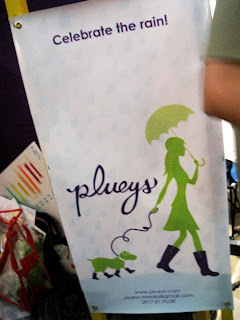 this is what we saw: plueys! 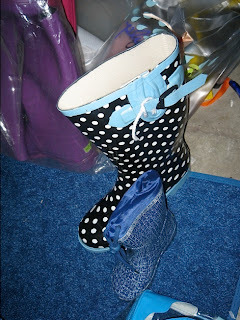 pluey means "rain" in french, but now is synonymous to rubber rain boots. and the timing couldn't have been more perfect. (actually, LAST weekend would've been more perfect as the non-stop rains began well over a week ago.) 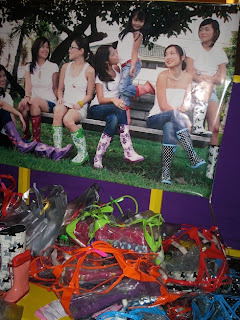 for P1,900 you get a pair of plueys, a clear plastic tote bag to match the boots, another frosted plastic tote bag, plus a pair of socks. (kids' boots are priced at P950, so lucky you if you have tiny feet.) and they have several prints to choose from—cute! ok, ladies, time to get yourself a pair of rubber boots because there is no reason to arrive in the office or at school with wet feet! especially if you have to commute! just pack your pumps into your tote to change into when you get to work :-) you can still pick a pair of plueys till tomorrow or e-mail plueys.manila@gmail.com or call the hotline 0927-817-5843. Hey!!! I was there... but as a buyer. I sure miss our forever spot. haha!! I think Rockwell's move of putting new tenants made the Urban Bazaar more interesting and worth going to. Come on we are just an escalator away. did you get a free pair of boots in exchange for this post? to anonymous: nope, we didn't. we don't even know the distributors. 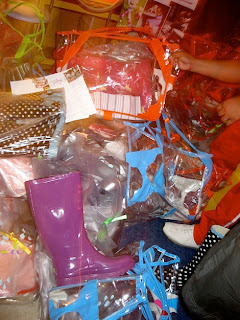 we're quite enthusiastic about this trend because now maybe women and kids won't hesitate to put on a pair of rubber boots (plueys or not) when it's pouring outside. there's no reason to ruin a perfect pair of shoes wading through ankle- (or even knee-) deep water. this is, after all, the philippines, where it rains half the year and floods are a way of life.